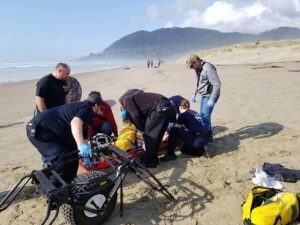 On Saturday afternoon, March 23rd, Nehalem Bay Fire & Rescue volunteers responded to Manzanita beach with reports of a woman injured by a log. A “sneaker wave” had come up the beach moving and rolling a log the woman was sitting on, causing it to roll over her; the woman sustain serious injuries and was flown to Portland for treatment. Follow-up reports state that she sustained over a dozen broken ribs and bruised lungs and will recover from her injuries. NBF&R remind beach goers to NEVER TURN YOUR BACK ON THE OCEAN. Beware the sneaker wave – They´re called sneaker waves because they appear without warning, often surging high up on the beach with deadly force, and are impossible to predict. Sneaker waves also carry a large amount of sand that can saturate your clothes, weighing you down and making escape difficult if not impossible. Watch those logs – The ocean is strong enough to pick up even the biggest log and plop it down on top of you. Some logs may look small, but even the tiny ones can be waterlogged and weigh tons. How to play it safe: If you see a log in the surf or on wet sand, stay off it. Rip currents – Rip currents are strong currents of water that rush out to sea. They are stronger than even the best swimmer. These currents can swiftly sweep unwary beachcombers and waders off their feet and out to sea. Rip currents may appear as dark, choppy water. Most of Oregon’s beaches are NOT for “swimming” with extremely cold water temperatures and changing currents, if you plan to swim, wear a wetsuit and a life jacket. Any time you see debris and foam floating out to sea, chances are you have found a rip current. Avoid the area. How to play it safe: Parents keep your kids close when playing in the ocean. If caught in a rip current, don’t panic . Swim parallel to the beach until you are out of the current, then head for the beach. Know the tides – Incoming tides isolate rocks from headlands and the shore. Avoid the temptation of strolling out to an interesting rock without knowing when the tide rolls back in. Free tide tables are readily available at state park offices, information centers and many shops and motels. How to play it safe: Stay off rocks and small, enclosed beaches. Know when the tide is coming in by visiting the tidetable websitetidetable websitetidetable website at the Hatfield Marine Science Center, or download a free tide table app. High waves can reach you – Tides and waves can sweep over rocks, jetties and headlands, knocking you off and carrying you out to sea. How to play it safe: Assume nothing is “high enough” and avoid exposed rocks, jetties and headlands during strong wave action (like during and after storms). Beware of high, steep cliffs – Assume that all cliff edges are unstable. Wet trails or soft sand and earth can make for unstable footing. Rocks can be slippery even when it isn’t raining. Heads up – Standing at the base of an oceanside cliff can be dangerous, especially if it has an overhang. In some places, winter storms and high waves have eroded the shoreline, increasing the chance of collapse and slides.